If you’ve been following my blog, you’ll remember me telling you we needed to do something with the blank wall in our living room (Great ideas for blank walls part 1: my wall art wish list.). 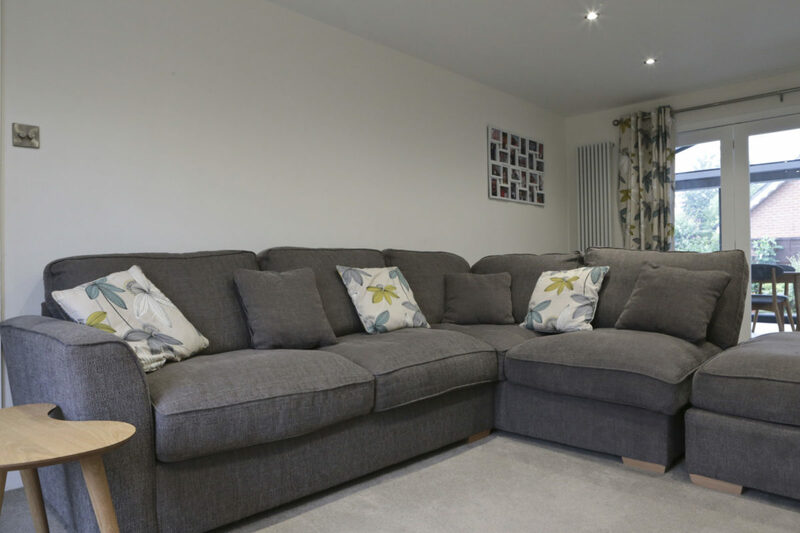 We renovated our living room when we added a single storey extension to the back of our house two years ago. Since then, as well as looking for new artwork for the expansive blank wall, I’ve been struggling to decide how best to display it. This month, I’m delighted to say the bare wall has gone (as has the smushed bug stain). 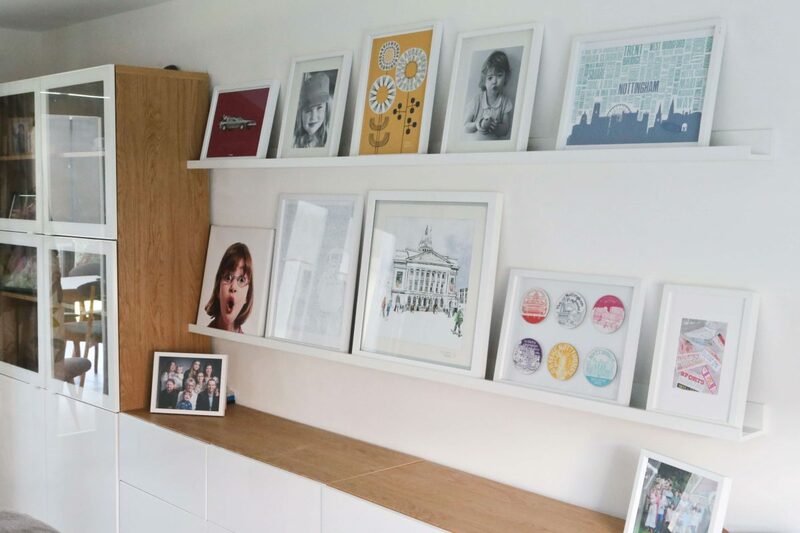 In its place, we have a gorgeous gallery wall of our favourite photos, pictures and prints, thanks to Ikea Mosslanda picture ledges. So why has it taken me so long to fill my blank wall? I can’t believe it’s taken us more than two years to populate the bare wall in our living room. 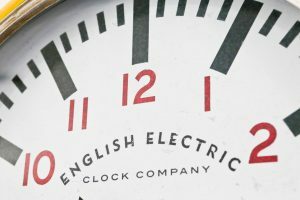 I’ve been so busy with parenting, blogging, volunteering and working part-time, it kept dropping down my burgeoning ‘to do’ list. Plus, I wasn’t sure what to do with the wall. I did spend quite a bit of time thinking about filling my blank wall, though! In my defence, our wall wasn’t completely blank for those two years. 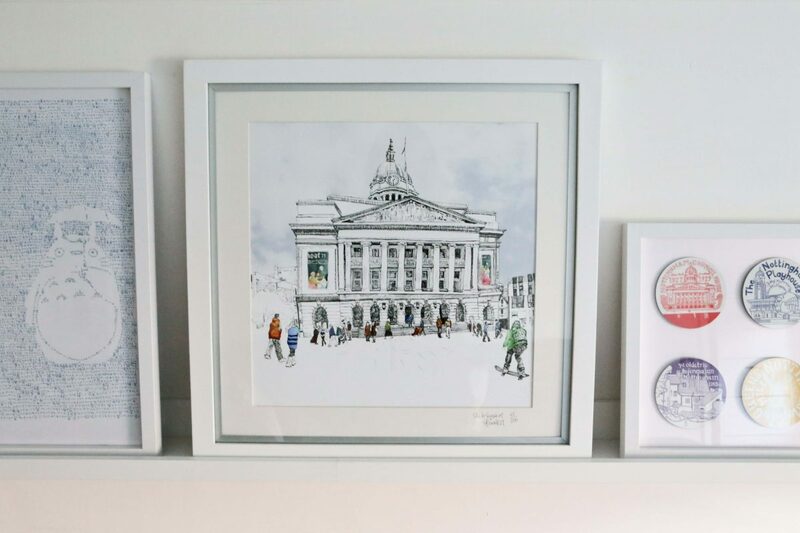 We still had a solitary picture hook on the wall after the refurbishment, so we filled the space with a Totoro print, a Tubular Fells print and latterly, a gorgeous limited edition print of Nottingham’s Council House, by local artist Hannah Sawtell. I discovered Hannah’s work after seeing her beautiful Wollaton Hall print at a friend’s house and Mr T kindly bought me this lovely ‘Slab Square’ for my birthday. Although we’re pleased with our Ikea Besta furniture, colourful curtains and comfy corner sofa, the walls were crying out for the splash of colour and interest photos, artwork and prints can bring. Without pictures and paintings, our living room felt cold and clinical. That’s probably why we tended to spend much of our time in our open plan kitchen/living/dining area instead. The bare wall in our living room. The ‘Smushed bug’ wall. 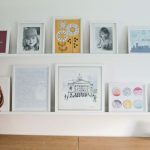 Before I discovered picture ledges, I was all set to create a conventional gallery wall, inspired by my blogging mates Caro Davies over at The Twinkle Diaries and Karen Knox at Making Spaces and my fabulously creative non-blogging friend Tracy. Despite being inspired by other people’s gallery walls, I had a few reservations about creating my own gallery wall. Firstly, it seemed like too much hard work and I didn’t know where to start. Secondly, I like order and symmetry, so the randomness of conventional gallery walls freaked me out a bit. Despite my fear of randomness (! ), I did make a start with my gallery wall plans, winning a small victory for order and symmetry by ensuring that all of the artwork for my proposed gallery met strict entry requirements: They had to have a white frame. Some of my favourite prints failed the test and I had to spray the frames white. However, despite making some progress, I still wasn’t convinced by the idea of a conventional gallery wall. My main concern being the fact I’d have to rethink the layout if I wanted to add new artwork or change any of the existing prints. 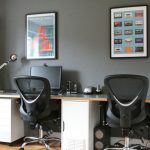 That’s when I discovered the perfect gallery wall solution whilst visiting our local Ikea store: Mosslanda picture ledges. 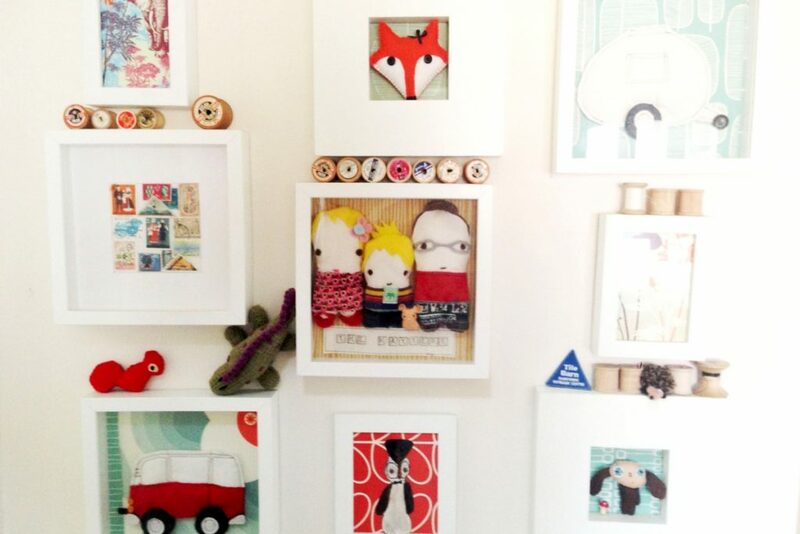 The Ikea Mosslanda picture ledge takes the hard work and effort out of creating a gallery wall. 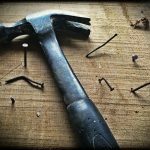 No need to worry about designing layouts, cutting out templates or working out where to put the picture hooks. 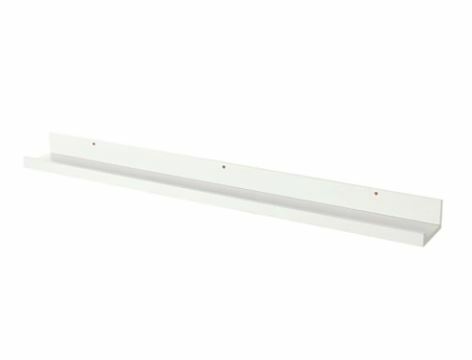 The picture ledges, (available in black or white), are great value too, at only £4.95 for the 55cm ledge and £8.85 for the 115cm ledge. Fixings aren’t included, but adhesive covers for the screw holes are supplied. 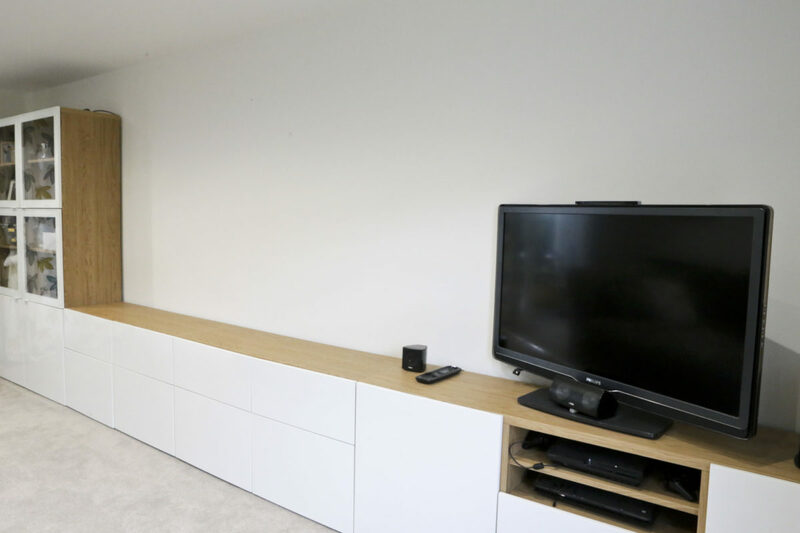 Our first two Ikea Mosslanda Picture Ledges installed on our living room wall. Even with our dodgy hollow walls, we successfully mounted four 115cm Mosslanda shelves (3 screws required per shelf) to the wall with ease. 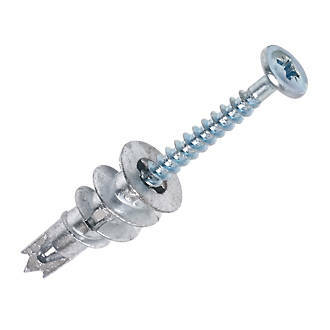 For hollow walls like ours, we prefer to use the self-drill fixings shown below. That’s because our walls are ‘dot and dab’ hollow walls, which means fixings designed to spread/open in the cavity between the plasterboard and blockwork don’t always work. What a difference the addition of a picture ledge gallery wall makes to our living room. Our once dreary space has been transformed from cold and clinical to colourful and welcoming with the addition of our favourite pieces of artwork and much-loved photos. I’m so pleased we are finally able to display some of our favourite prints and photos. 1. 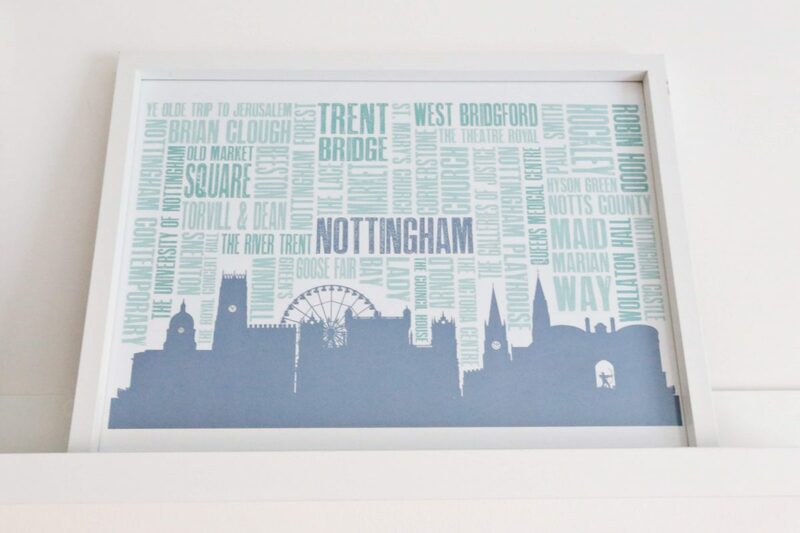 Homemade Nottingham landmarks print. I love living in Nottingham, where I’ve lived since moving from Stockton-on-Tees in 1990 to study Pharmacy at University. 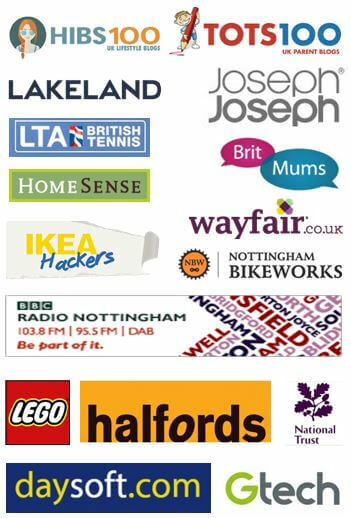 I decided it would be a lovely idea to create a ‘homage to Nottingham’ and so I designed this print in photoshop using Nottingham’s skyline and the names of its famous people, places and landmarks. What do you think? 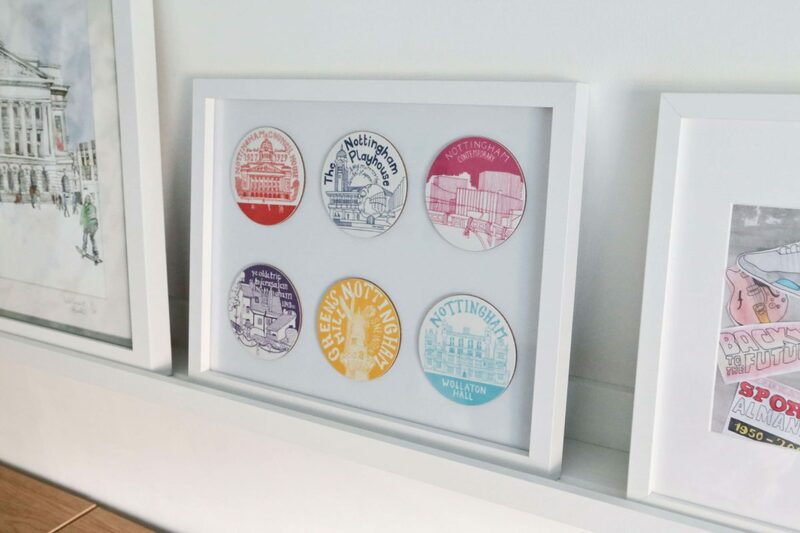 Mr T bought me a set of beautiful 6 letterpress coasters featuring Nottingham landmarks for my birthday. They seemed to pretty to use so I decided to frame them instead. They’re from a lovely independent shop in Nottingham called Pop Press, who specialise in making letterpress goods in their small workshop. 3. 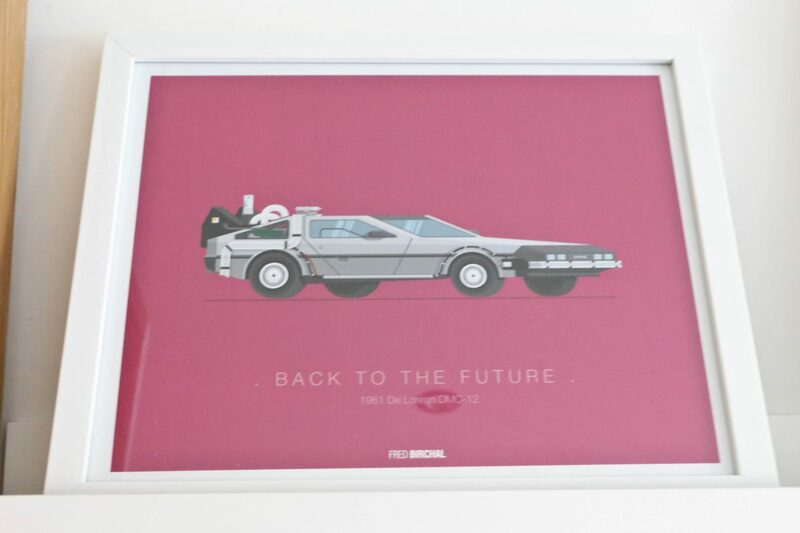 Back to the future DeLorean print. Mr T is a massive Back to the Future fan. I spotted this fabulous Fed Birchall print in Homesense and knew it would be the perfect Christmas gift for him (and a colourful addition to our gallery wall). 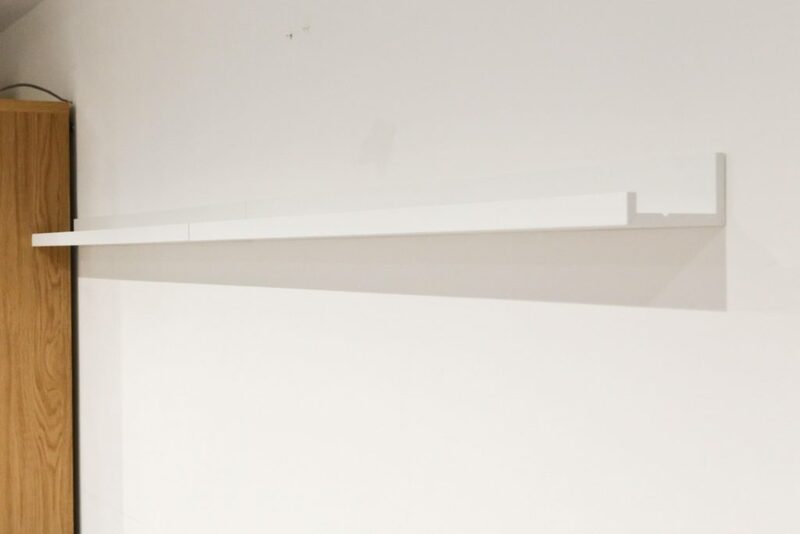 Picture ledges are a flexible gallery wall solution. 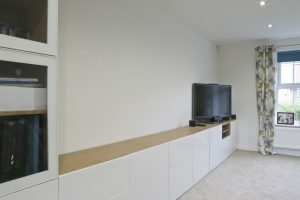 The advantage of using picture ledges rather than conventional gallery walls for displaying your wall art is the flexibility. 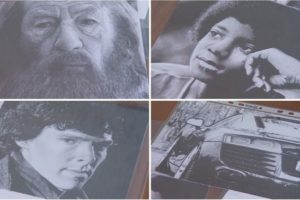 You can change the position of your favourite photos and prints as many times as you like. 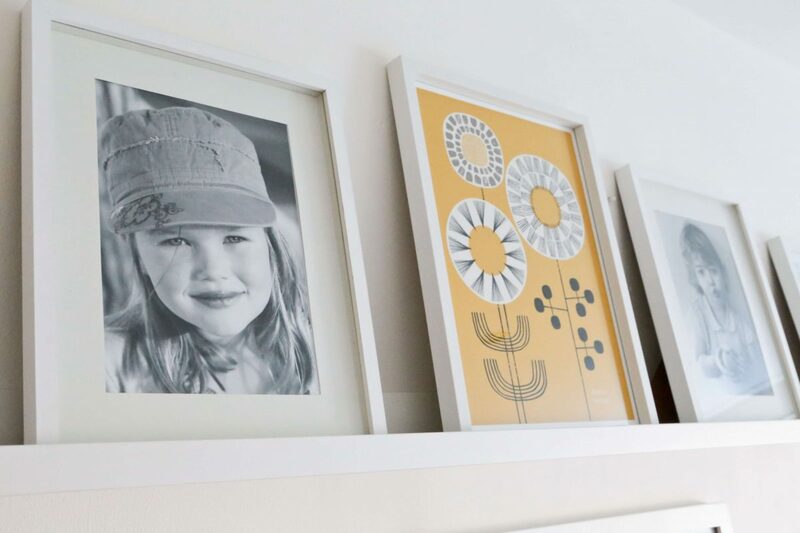 What’s more, if you’ve got more art than you have space for, or if you pick up something new and want to show it off, picture ledges give you the option of rotating your artwork too. A blank wall no more. We’re delighted with our new gallery wall and wish we’d discovered picture ledges sooner. Having all of our favourite photos and wall art on display has added a much needed finishing touch to our living room. 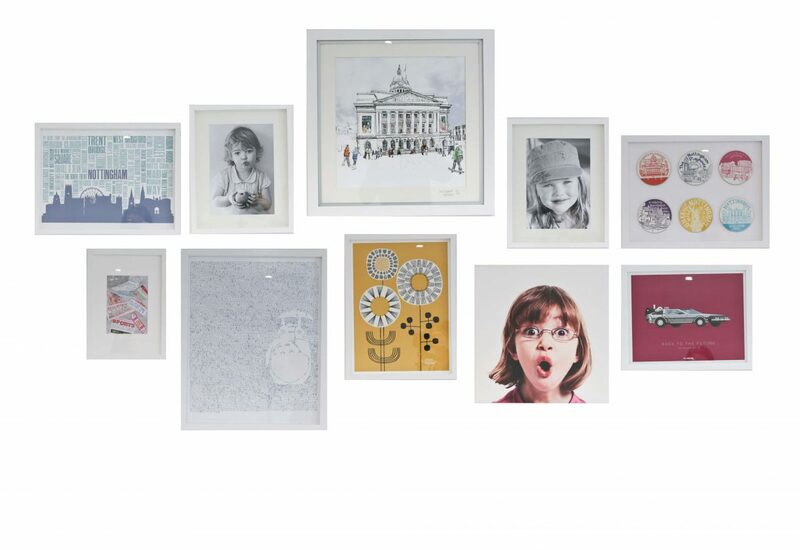 We look forward to dusting off some of our other photos in the months ahead and even if we buy something new, with a picture ledge gallery wall we’ll be able to find a space for it…As long as it has a white frame!! I’m delighted we’ve finally managed to fill the blank wall in our living room. 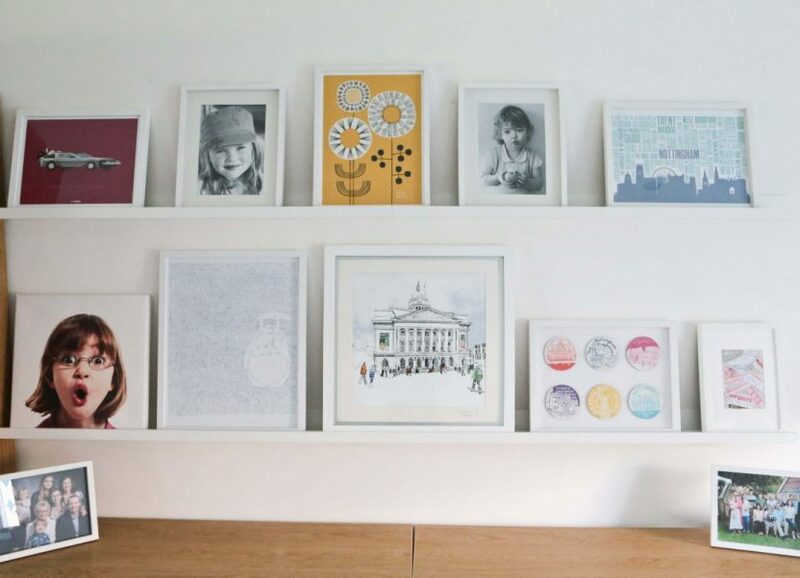 Do you have a bare wall itching to be filled with all the lovely photos, pictures and prints you’ve got hidden away in cupboards and the loft? 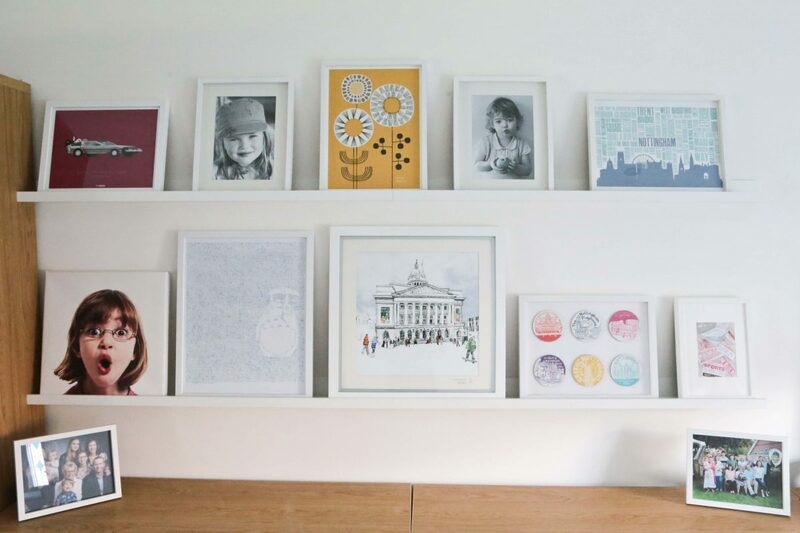 If you’re daunted by the idea of a ‘freestyle’ gallery wall requiring careful planning, could a picture ledge be the answer? As always, I’d love to hear from you. The IkeaHackers book is out now & my Ikea Hack bed is featured! (Win a copy). 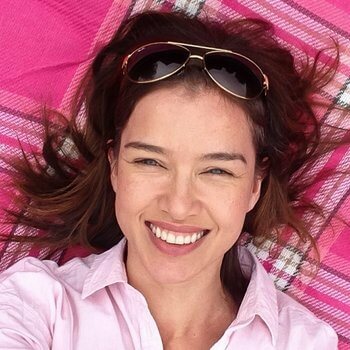 At last, I can officially share some exciting news! 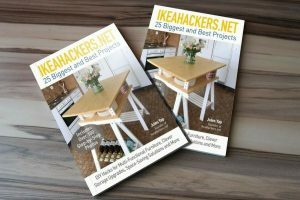 Jules Yap, founder of the highly successful website IkeaHackers.net, has published a book of 25 biggest & best Ikea Hacks & my Ikea Hack Cabin bed with secret den is featured! I might have to steal this idea Jane! You’ve inspired me! We’ve also had blank walls in our sitting room since we redecorated 15 months ago and much as I love the minimal look it’s a bit stark! I like the flexibility of this and that fact you can change things around etc without me having to fill endless holes in the wall! Well, I say me…. I do of course mean Mark! Ha! Ha! It’s a nifty idea isn’t it?! When I fall out with the kids, I’ll replace their pictures with a tranquil landscape or something! I absolutely love this idea! How clever to organise your pictures on these ledges, and it gives more versatility to swap and change in future too. I’m inspired! Ah, thanks so much Carol! I don’t know why I didn’t think of something like this sooner! I can definitely recommend them. Great value too! Thats so freaky – I have just sat down to read your post after literally just putting 2 of these shelves in the garage!! 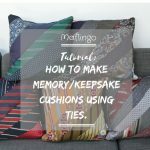 I’ve used them for years all over the house – they’re brill, so versatile. 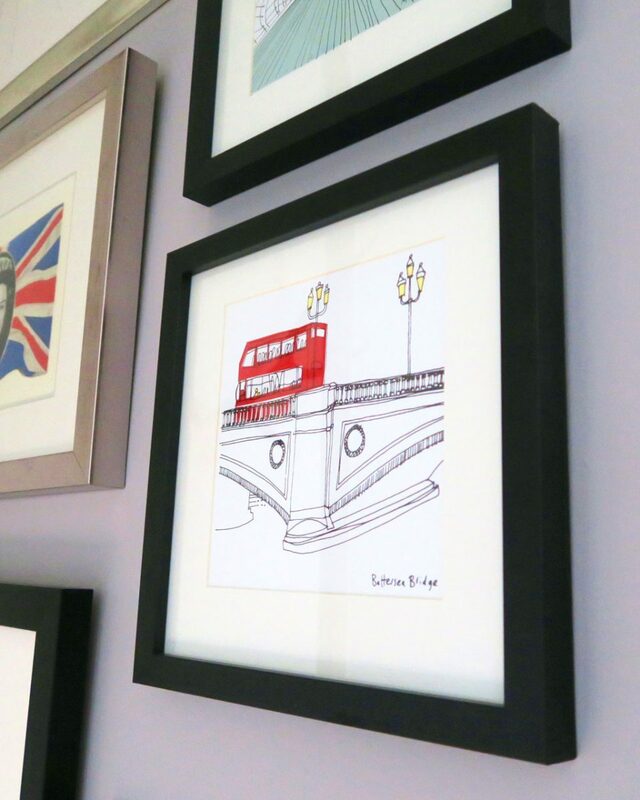 Looks like you’ve got some great artwork there – I love your slab square one, I have one by Hannah Sawtell too, it still needs a frame though, and I’ll have to rearrange my gallery wall to fit it in! Great minds!! So relieved we finally have a wall full of pictures! Hope the DIY sofabed doesn’t take as long! He! He! Thanks! Mind you, I got all excited that you’d done another she-shed post then! Mind you, I may have missed some so I’m going to go back and check. The last one I watched was the one with the video of the boys. Loved it.